The collector of the Sahih Muslim, Muslim ibn al-Hajjaj, was born into a Persian family in 204 AH (817/18 CE) in Nishapur (in modern-day Iran) and died in 261AH (874/75 CE) in the city of his birth. He travelled widely to gather his collection of ahadith (plural of hadith), including two areas now in Iraq, the Arabian Peninsula, Syria and Egypt. Out of 300,000 hadith which he evaluated, approximately 4,000 were extracted for inclusion into his collection based on stringent acceptance criteria. Each report in his collection was checked and the veracity of the chain of reporters was painstakingly established. 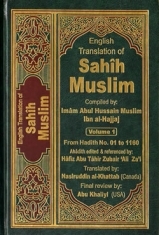 Sunni Muslims consider it the second most authentic hadith collection, after Sahih al-Bukhari. Sahih Muslim is divided into 43 books, containing a total of 7190 narrations.